An exploratory artist, outspoken activist, influential educator, and possessor of one of the most personal and expressive pianistic styles in improvised music, Fred Hersch has led a singular life that has shaped one of the most acclaimed and influential voices in modern jazz, and he’ll share that experience with From the Top in an upcoming taping in Boston on October 14. At the forefront of music for more than three decades, Hersch has earned countless awards and accolades including 12 Grammy® nominations. Hailed by Vanity Fair as “the most arrestingly innovative pianist in jazz over the last decade,” he stands as a defining figure in several different contexts, credited with more than 40 albums that span breathtaking solo recitals, compelling duos, gold-standard trios, and innovative chamber pieces. 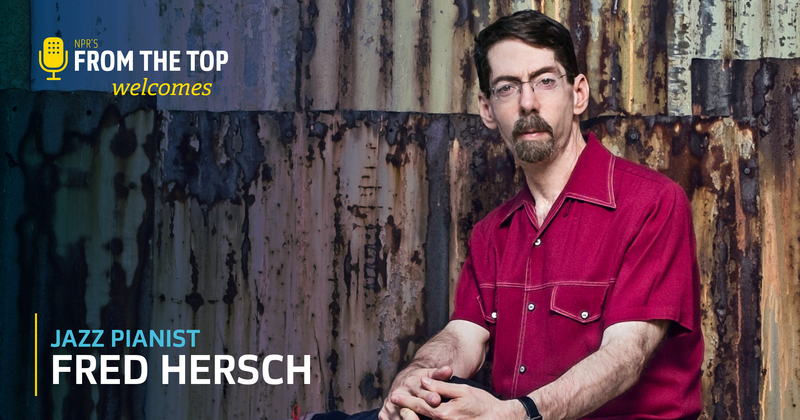 Hersch has told his inspiring story in his new memoir, “Good Things Happen Slowly: A Life In and Out of Jazz”; in the feature documentary “The Ballad of Fred Hersch”; and on stage in the confessional jazz-theater piece “My Coma Dreams”. Hersch taught for many years at New England Conservatory; he is currently a Visiting Artist at Rutgers University. Hersch will join From the Top in our home concert hall, New England Conservatory’s Jordan Hall in Boston, on Sunday, October 14 at 2 PM. The show will be Guest Hosted by From the Top alum Yuga Cohler. The award-winning Kairos Quartet from the Chicago-area, featuring Joshua Brown (violin/viola), Julian Rhee (violin/viola), Thompson Wang (violin), and Lydia Rhea (cello). Tickets start at just $15 for adults and are free for students of all ages (discount does not apply to orchestra seats). This show is supported by the Massachusetts Office of Travel and Tourism.